SWAZILAND, OCTOBER 2000 - Arriving in South-Africa, especially when landing in Johannesburg, seems like arriving in a major airport of the USA. You see the same high-rise buildings, the modern airport buidings with parking lots, taxi-spaces and rental cars... But what you also can see from the sky is the vast 'townships' that are all over the place near the big city. Indeed South-Africa is maybe the most 'western' African country, but there exists a big gap between the 'rich' and 'poor'. On my trip I also visited the Kingdom Of Swaziland, which is an independent country in the interior of South-Africa. As soon as you cross the border, you notice the difference. 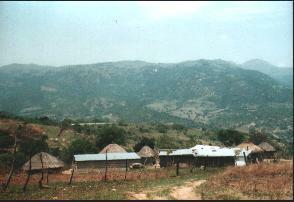 Houses are poor, mostly only clay huts with a straw roof. The main road is sponsored by South-Africa. Besides this highway, mostly only dust roads is what you'll find. You see people walking along the side of the highway. We intended to visit a typical 'kraal' (local family housing). Of course people are used to tourists and know you'll have something to give away - as soon as the car has stopped, tens of children come out of nowhere... After our guide asked the inhabitants of the 'kraal' permission to visit their homes, we could enter their houses and look at their furniture, their entire household, their bed, etc... At some point, this was quite embarrasing, mostly for us - imagine people stopping right now in front of your house and asking if they could take a look around, entering your kitchen, bedroom and bathroom ! But on the other hand, the gifts (worn clothes we wanted to throw away anyway - these are still better than the ones they wear - soap, shoes, ...) make them happy - and you can tell this is not acted. "In a way these people seem a lot happier than we do", I thought. I gave some boy - of about 15 years old I guess - a pair of shorts and a T-shirt. He just couldn't stop looking at them, and the big smile on his face... that was something I'll never forget. He quickly ran away holding the old clothes as if it was his treasure. Maybe he would sell them because they were 'too good' for him. This often happens. People get this way some money to buy some meat or something else they need. Next to the main road are plenty of little stalls selling the typical souvenirs like wooden or soapstone elephants and rhino's, african masks, etc... Every time you visit such a stall it's hard to resist not to buy something. These things cost only a few Euros, but for most of them it's their only income. And one must admit it , they are good in making these sculptures. Often next to the stall, you can see them making the objects they sell. One more reason to buy : the smile on their face when you agree to buy for a bargained price. Some textbooks will tell you it's not the 'true African Art' you buy there... but the buying by itself makes it more worthwile. Something bought in a fancy shop will mostly not help these people next to the road. Next stop was a primary school. Again plenty of people surrounding us immediately. 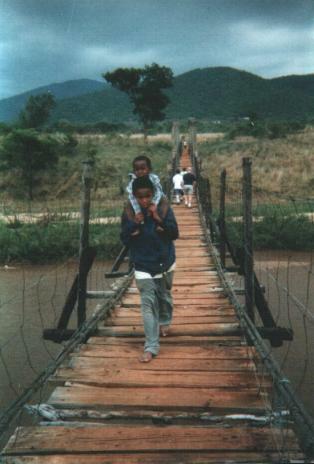 We first had to cross on foot a very basic hanging bridge across the river. It was the only access to their school. Inside the school the children were as excited as we were. They showed us their classroom and their books, and they were proud about it. We gave some of them a pen. Most of these kids don't have a pen or pencil because their parents cannot afford one. The school does not supply the children with pens and note books etc... Imagine all the paper we waste everyday... it really makes you very quiet. Again the happiness of the children was present everywhere - someone let them look at themselves using his video handheld camera. True magic for these kids, big fun for us too. Some hours later I was sitting in the bar of the hotel, drinking some wine. The contrast of that day was really too much. That evening the locals also had a surprise for us. 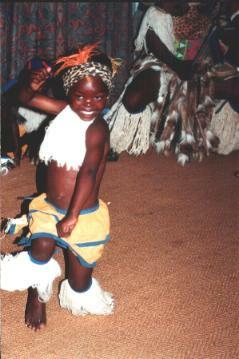 All of a sudden, a group of dancers, mostly children, came into the bar; accompanied by African drums. For about fifteen minutes they have been performing typical Swazi dancing. It made me think back of the children we had seen earlier that day next to the road dancing for money, stopping with their dancing as soon as the tourists were gone. Of course these kids dancing right here also expected some little money, but one could see they were also enjoying the dancing and their motivation came from their hearts. This is where I saw some of their roots, their original culture. How gray their day-to-day life may be, how they may hunger for more western 'modern' things, a 'better life',... they all seem to forget it as they dance to the beats of the drums. Later on my travel, I've encountered many street dancers and visited organised African dance performances, but the spirit of that evening was never matched again.